Applying heat locally to healthy tissue encourages restructuring deep down. The Capsiblist formula contains extract of capsicum, a plant rich in capsaicin, which creates heat locally without any abrasive effect on tissue. Depending on the level of heat required, Iodblist (gentle heat) or Capsiblist (strong heat) may be recommended. 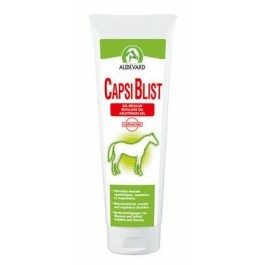 Capsiblist contains capsicum, a plant rich in capsaicin. After application of the product, wait at least six days before entering any competitions. Composition:Capsicum extract 5 % (pure capsaicin 0,025 %), methyl nicotinate 2 %. Instructions for use: external use only. Rub into the concerned area, two to three times per day. Handle with care. Avoid contact with mucous membranes, especially the eyes. Gloves must be worn when handling the product. If gloves were not worn, wash hands thoroughly after using the product. Please Note:This formula contains capsaicin, ask for advice concerning use in competition.